The X-Files, which premiered 20 years ago this week, was groundbreaking during its run. And although it's been off the air for 11 years, its influence is still being felt today. Here's a rundown of how the show's legacy reverberates through the television landscape and beyond. Throughout its run, The X-Files was divided between stand-alone episodes and mythology episodes. This isn't a new concept now; it's standard operating procedure on shows such as Doctor Who, Supernatural, Buffy the Vampire Slayer, Angel, Fringe, Grimm, Smallville, Veronica Mars ... The list is a long one. But it was The X-Files that pioneered the idea of the myth arc, an overarching storyline that spans seasons or the entire series. Mulder's search for his missing sister leads him to uncover the secrets of the alien conspiracy, which drives the entire show. Granted, the myth arc lost steam badly in the final seasons when it became clear that creator Chris Carter didn't have a terribly solid endgame in mind. Still, the abductions, the black oil, the alien bounty hunters, the Syndicate, they all kept us tuning in week after week to see how they fit into the grand view of the world that the show was presenting. Monster-of-the-week flukeman still haunts my nightmares. In contrast to the myth arc, the monsters of the week are the stand-alone bad guys who don't feed into the overall storyline and are wrapped up by the end of the episodes. This is the Twilight Zone-style of storytelling that The X-Files perfected, creeping us out week after week while letting us learn more about the main characters. 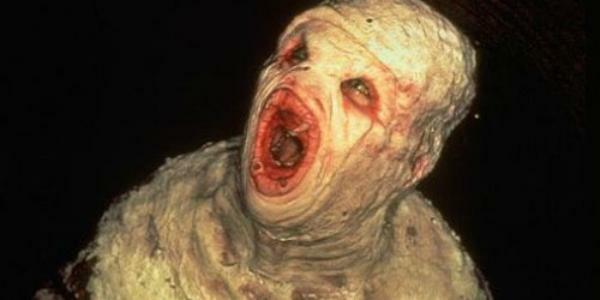 The best, scariest X-Files episodes were monsters of the week, in my opinion. One and done, they hold up much better under repeated viewing in comparison to the myth arc episodes that require you to remember what came before (and inevitably be disappointed by what came after). If you're not convinced, check out the many eye-scorching Angelfire sites dedicated to the show, which tells you all you need to know about fan excitement on the mid-90's Internet. 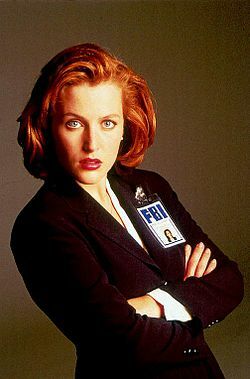 A smart, skeptical female scientist who carries a gun and takes care of business, Dana Scully wasn't an archetype that was often seen on television prior to The X-Files. There was a distressing tendency, particularly in the early episodes, to put Scully in peril until Mulder could swoop in and rescue her, but over the course of the show, she returned the favor for him many times. And no matter what jeopardy she faced, she remained a tough, capable agent who knew how to defend herself and used her intelligence to shed light on the perplexing cases she faced. Plus, she was the skeptic rather than the believer, which is an inversion of the typical television gender roles, and her strong Catholic faith represented an interesting contradiction in her makeup. In short, Gillian Anderson embodied one of the most iconic women in sci fi. And thank goodness she came along. Where would Olivia Dunham, Veronica Mars, Gwen Cooper and even Sydney Bristow be without her good example? Woof. This is the show that turned me into a shipper. The X-Files popularized the acronym UST — that's unresolved sexual tension, darlings — thanks to the crackling chemistry between the two leads. It was a show that deeply divided fans into shipper and noromos camps. The shippers obsessed over Mulder and Scully's every interaction, hoping for signs of romance. (Never before had I cared so much about what a glance or a touch of the hand might mean.) Meanwhile, the noromos group refused to read any romantic subtext into their scenes. (Joyless twigs that they are.) The intrepid agents ultimately became a romantic couple — and I will never ever forgive Chris Carter for allowing this to happen offscreen — but it was that lingering "will they or won't they" playfulness that sustained the tension for the first several seasons of the show. Fringe's investigators working within the law enforcement community to solve unexplained phenomenon. Supernatural's hunters trying to keep vulnerable humans safe from unearthly entities. Torchwood's pitch-black alien themes. Buffy the Vampire Slayer's mix of horror and humor. They all owe a debt, be it small or large, to The X-Files. To be sure, The X-Files itself took its cues from Kolchak: The Night Stalker and The Twilight Zone, to name two. But The X-Files is a hugely important link in the evolutionary chain of genre television. The X-Files also had an impressive pedigree of writers, directors and producers. Vince Gilligan went on to create Breaking Bad. The late Kim Manners exec produced and directed Supernatural. James Wong co-executive produces American Horror Story. Jeffrey Bell worked for Angel and Alias. Joss Whedon favorite Tim Minear wrote a few episodes, as did Neuromancer author William Gibson and horror legend Stephen King. Creater Chris Carter had an impressive stable of talent for his brainchild. Just discovered your blog. Love it! Thanks for what you're doing here. It's enjoyable to read! Great to see interest in the X-Files even after all this time.